The Wreck & Crash Mail Society was formed in the latter part of 1994, and is devoted to the collecting and study of all aspects of delayed and/or damaged mail and interrupted mail services. Currently the Society is composed of four study groups, namely: the Air Crash Study Group, The Railroad Wreck Study Group, the Ship Wreck Study Group, and the Suspended Mail/Conflicts Study Group. 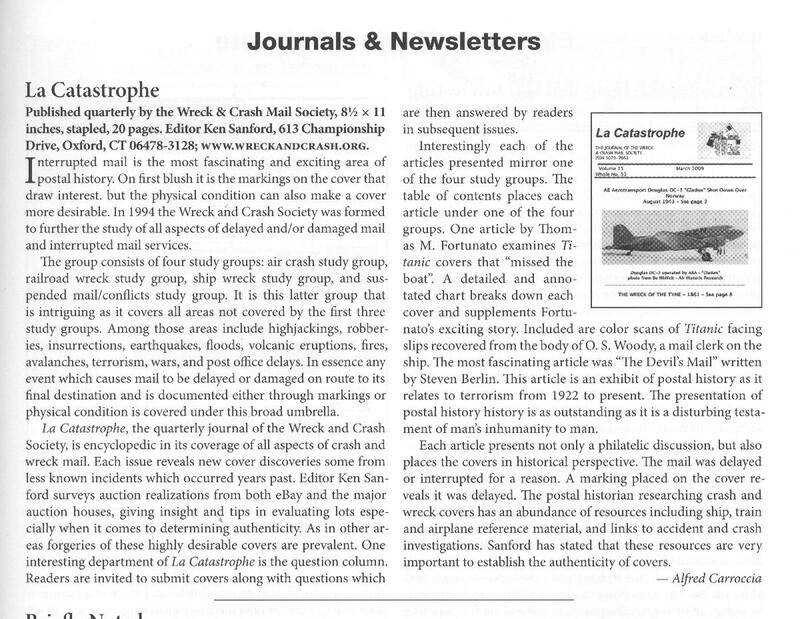 The Society publishes a quarterly journal "La Catastrophe", which contains articles on all aspects of wreck and crash mail, as well as news on new cover discoveries, auction realizations on wreck and crash mail, and questions from members who are seeking information on their crash and wreck covers and the stories behind them. The Wreck & Crash Mail Society normally holds an annual meeting (so far, all have been held in London), where members display parts of their collection, meet other collectors of wreck and crash mail, and exchange information and material with fellow members. If you have an interest in this area of postal history, we believe that the Wreck & Crash Mail Society will fulfill your interest. Annual membership dues are UK£15.00 or US$25.00, which includes a subscription to four issues of "La Catastrophe". The next meeting will be the Annual General Meeting during the Fall Stampex Exhibition, at the Business Design Center, Islington, London – Saturday 15 September 2018 from 1430 to 1630. Members will display 16 album pages of crash or wreck covers. Our main speaker is yet to be determined. This 128 page soft cover book, with 60 color pages, provides a complete history of letter & package bombs. Hacking communications systems is not a new thing that came in with the Internet. The postal system is just as susceptible to abuse of trust, be it theft, fraud, or striking out at enemies via mail bombs. Philatelists seldom write about mail bombs for the obvious reason that there is little material available. Successful mail bombs are usually shredded by the explosion, and unsuccessful devices are confiscated by police as evidence. The closest one can get to exhibition material are handstamped postal markings and labels, indicating that a letter has been inspected by security forces. Mail bombs are invisible postal history. The first recorded mail bomb was in 1764 in Denmark. 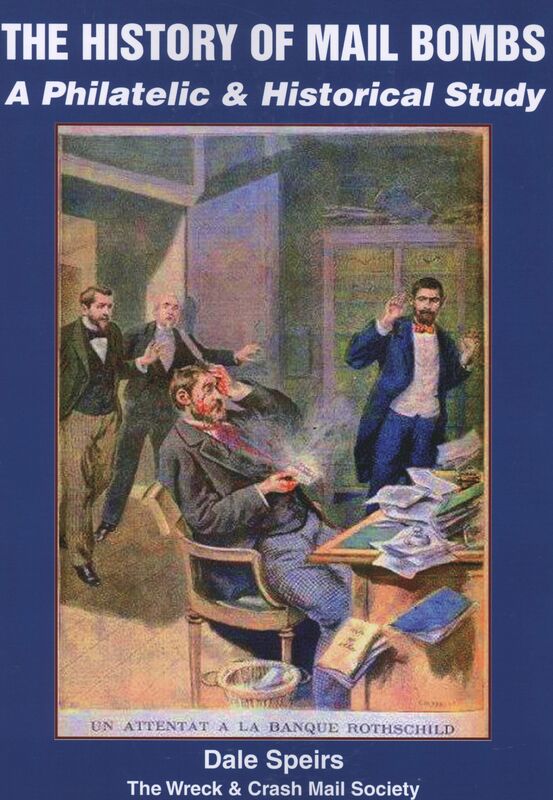 A mail bomb is known from 1881 in Australia, and in 1895 a letter bomb was sent to Baron de Rothschild in France, which exploded when he opened it. Letter bombs and package bombs have been sent through the mail for various reasons, such as revenge, political causes, terrorism, personal vendettas, or crazy people who have a grudge against society, like the famous unibomber. The book gives a history and background of all types of mail bombs and the people who sent them. Many different types of letter bombs are shown and described, as well as the various types of markings and labels used by postal authorities to indicate that a letter or package has been inspected to check against bombs or chemicals, such as anthrax. The book provides a fascinating look into an often overlooked aspect of the postal service and philately. The book is available for US$37.50 or UK£26.00 plus postage. Postage within the USA is US$3.00 (media mail), to Canada is US$6.00 (1st class), and to the rest of the World is US$25.00 (Global Priority Mail). Payment may be made by US$ check or money order made payable to Ken Sanford, or by PayPal to: kaerophil(a)gmail.com. For PayPal payments, please add 5% to the total. For orders in UK£, please inquire on postage and payment. Only 2 copies left.